Landing a contract with a big chain can mean a big boost to your business. However, as a supplier of pet goods, auto parts, or other consumer products, you may not have access to the capital you need to deliver the finished goods your new customer just ordered. Many distributors and suppliers do not have readily available lines of credit to provide advance payments required by offshore manufacturers. Most banks will not lend money against a purchase order because of the performance risk associated with the delivery of the products. If they advance funds and you don’t deliver the goods there could be an issue with paying back the bank. When Financing Options are Limited If you are like most distributors and suppliers, having a 150 trade cycle which includes the time to order, receive and distribute the goods and then wait for payment is nearly impossible if you are going to continue to seek new contracts or if God forbid your product sell through and they reorder. You need working capital to pay employees, have working capital to provide order or manufacture, and pay those bills which are necessary to keep operating. In some instances, you may need additional equipment or staff to meet a large contract. This is when finding someone who is willing to provide suppliers funding, or distributors funding becomes even more important. One of the challenges you may be facing as a supplier is your company credit score. We often find this holds many companies from growing their business. When we work with you to develop a funding program, we use the strength of your client’s credit to determine how much we can advance against your receivables. Whether you are interested in factoring invoices for one client, or for multiple clients, you never have to be concerned that your credit is going to hold you back. Whether you are a distributor or supplier, you need to have the materials on hand or finished good to fill orders. This can be challenging if your existing lines of credit are maxed out and you cannot increase them, or if you do not have access to lines of credit. 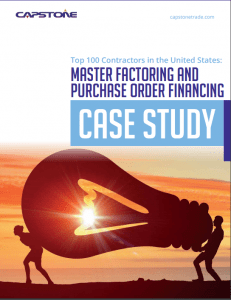 Capstone can help with purchase order financing and invoice financing allowing you to increase your working capital, deliver your presold goods and offer more flexible credit terms to your clients. We understand in order to remain competitive in any industry, you need to be able to fill the terms of your agreements, but you also need to be able to offer favorable terms to your clients. We will work with you to determine what products best meet your needs and help design a financing package that addresses those needs. Every business owner has different funding needs. At Capstone, we take the time to discuss your long-term goals, your current financing needs, and your potential future financing needs. Then we find the right solution for you. We can use a combination of funding tools to help with distributor financing, and supplier financing using whatever combination best meets your needs. Another advantage of distributor factoring, and supplier factoring is you are not going into debt. We provide funds against invoices which are already issued to your end buyer, and we collect when they pay their bill to you. This means fast cash for you, rather than waiting 30 to 90 days to collect on goods you have already delivered. In addition, you do not need to worry about chasing payment for these invoices because our collection team handles all the collections on invoices you have factored.